"Yasukuni" redirects here. For the film, see Yasukuni (film). The Imperial Shrine of Yasukuni, informally known as the Yasukuni Shrine (靖国神社 or 靖國神社, Yasukuni Jinja), is a Shinto shrine located in Chiyoda, Tokyo, Japan. It was founded by Emperor Meiji in June 1869 and commemorates those who died in service of Japan from the Boshin War of 1868–1869 to the First Indochina War of 1946–1954. The shrine's purpose has been expanded over the years to include those who died in the wars involving Japan spanning from the entire Meiji and Taishō periods, and the lesser part of the Shōwa period. The shrine lists the names, origins, birthdates, and places of death of 2,466,532 men, women and children, including various pet animals. Among those are 1,068 convicted war criminals, 14 of whom are A-Class (convicted of having been involved in the planning, preparation, initiation, or waging of the war). This has led to many controversies surrounding the shrine. Another memorial at the Honden building commemorates anyone who died on behalf of Japan, but includes Koreans and Taiwanese who served Japan at the time. In addition, the Chinreisha building is a shrine built to inter the souls of all the people who died during WWII, regardless of their nationality. It is located directly south of the Yasukuni Honden. Various Shinto festivals are associated with the shrine, particularly in Spring and Autumn seasons when portable Mikoshi shrines are rounded about honoring the ancestral gods of Japan. A notable image of the shrine is the Japanese Imperial Chrysanthemum featured on the gate curtains leading into the shrine. More recently, the visitation of the shrine by active Japanese diplomats and legislators have brought public controversy in global media. The current 13th High Priest incumbent of the shrine is Tatebumi Yamaguchi, who was appointed on 1 November 2018 after Kunio Kobori. The site for the Yasukuni Shrine, originally named Tōkyō Shōkonsha (東京招魂社, "shrine to summon the souls"), was chosen by order of the Meiji Emperor. The shrine was established in 1869, in the wake of the Boshin War, in order to honor the souls of those who died fighting for the Emperor. It initially served as the "apex" of a network of similar shrines throughout Japan that had originally been established for the souls of various feudal lords' retainers, and which continued to enshrine local individuals who died in the Emperor's service. Following the 1877 Satsuma Rebellion, the Emperor had 6,959 souls of war dead enshrined at Tōkyō Shōkonsha. In 1879, the shrine was renamed Yasukuni Jinja. The name Yasukuni, quoted from the phrase 「吾以靖国也」 in the classical-era Chinese text Zuo Zhuan (Scroll 6, 23rd Year of Duke Xi), literally means "Pacifying the Nation" and was chosen by the Meiji Emperor. The name is formally written as 靖國神社, using obsolete (pre-war) kyūjitai character forms. 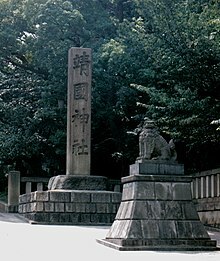 Among the enshrined are Yoshida Shōin, Sakamoto Ryōma, Takasugi Shinsaku, Nakaoka Shintarō, Takechi Hanpeita, Sanai Hashimoto, and Ōmura Masujirō, who contributed to the Tokugawa shogunate's overthrow and the Meiji Restoration during the Bakumatsu period in Japan. In contrast, the shrine does not enshrine the war dead of shogunate retainers such as soldiers of the former Shogunate forces, Ouetsu-reppan alliance, Shinsengumi, and Shogitai. Although Saigō Takamori, Eto Shinpei, and Maebara Issei made a contribution to the Meiji Restoration, they were not enshrined because they revolted against the Meiji government after that. The enshrinement of war dead at Yasukuni was transferred to military control in 1887. As the Empire of Japan expanded, Okinawans, Ainu, and Koreans were enshrined at Yasukuni alongside ethnic Japanese. Emperor Meiji refused to allow the enshrinement of Taiwanese due to the organized resistance that followed the Treaty of Shimonoseki, but Taiwanese were later admitted due to the need to conscript them during World War II. In 1932, two Sophia University (Jochi Daigaku) students, who were Catholic refused visit to Yasukuni Shrine on the grounds that it was contrary to their religious convictions. In 1936, the Society for the Propagation of the Faith (Propaganda Fide) of the Roman Curia issued the Instruction Pluries Instanterque, and approved visits to Yasukuni Shrine as an expression of patriotic motive. This response of the Catholic Church helped the university avoid a fateful crisis, but it meant its bowing down to the military power and control by Emperor system. By the 1930s, the military government sought centralized state control over memorialization of the war dead, giving Yasukuni a more central role. Enshrinements at Yasukuni were originally announced in the government's Official Gazette so that the souls could be treated as national heroes, but this practice ended in April 1944, and the identities of the spirits were subsequently concealed from the general public. The shrine had a critical role in military and civilian morale during the war era as a symbol of dedication to the Emperor. Enshrinement at Yasukuni signified meaning and nobility to those who died for their country. During the final days of the war, it was common for soldiers sent on kamikaze suicide missions to say that they would "meet again at Yasukuni" following their death. 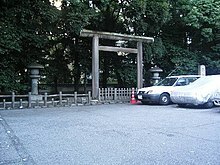 After World War II, the US-led Occupation Authorities (known as GHQ) issued the Shinto Directive, which ordered the separation of church and state and forced Yasukuni Shrine to become either a secular government institution or a religious institution independent from the Japanese government. Yasukuni Shrine has been privately funded and operated since 1946, when it was elected to become an individual religious corporation independent of the Association of Shinto Shrines. The GHQ planned to burn down the Yasukuni Shrine and build a dog race course in its place. 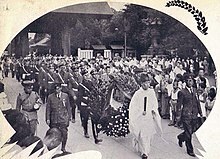 However, Father Bruno Bitter of the Roman Curia and Father Patrick Byrne of Maryknoll insisted to GHQ that honoring their war dead is the right and duty of citizens everywhere, and GHQ decided not to destroy the Yasukuni shrine. Moreover, the Roman Curia reaffirmed the Instruction Pluries Instanterque in 1951. The shrine authorities and the Ministry of Health and Welfare established a system in 1956 for the government to share information with the shrine regarding deceased war veterans. Most of Japan's war dead who were not already enshrined at Yasukuni were enshrined in this manner by April 1959.War criminals prosecuted by the International Military Tribunal for the Far East were initially excluded from enshrinement after the war. Government authorities began considering their enshrinement, along with providing veterans' benefits to their survivors, following the signature of the Treaty of San Francisco in 1951, and in 1954 directed some local memorial shrines to accept the enshrinement of war criminals from their area. No convicted war criminals were enshrined at Yasukuni until after the parole of the last remaining incarcerated war criminals in 1958. The Health and Welfare Ministry began forwarding information on Class B and Class C war criminals (those not involved in the planning, preparation, initiation, or waging of the war) to Yasukuni Shrine in 1959, and these individuals were gradually enshrined between 1959 and 1967, often without permission from surviving family members. Information on the fourteen most prominent Class A war criminals, which included the prime ministers and top generals from the war era, was forwarded to the shrine in 1966, and the shrine passed a resolution to enshrine these individuals in 1970. The timing for their enshrinement was left to the discretion of head priest Fujimaro Tsukuba, who delayed the enshrinement through his death in March 1978. His successor Nagayoshi Matsudaira, who rejected the Tokyo war crimes tribunal's verdicts, enshrined the Class A war criminals in a secret ceremony in 1978. Emperor Hirohito, who visited the shrine as recently as 1975, was privately displeased with the action, and subsequently refused to visit the shrine. The details of the enshrinement of war criminals eventually became public in 1979, but there was minimal controversy about the issue for several years. No Emperor of Japan has visited Yasukuni since 1975, although the Emperor and Empress still continue to attend the National Memorial Service for War Dead annually. The head-priest Junna Nakata at Honzen-ji Temple (of the Shingon sect Daigo-ha) requested the pontiff Pope Paul VI to say a Mass for the repose of the souls of the 1,618 men condemned as Class A, B and C war criminals, and he promised to do so. In 1980, Pope John Paul II complied, and a mass was held in St. Peter's Basilica for the 1,618 war criminals. Yasukuni Shrine's museum and web site have made statements criticizing the United States for "convincing" the Empire of Japan to launch the attack on the United States in order just to justify war with the Empire of Japan, as well as claiming that Japan went to war with the intention of creating a "Co-Prosperity Sphere" for all Asians. See details on related controversy in Controversies surrounding Yasukuni Shrine. December — (Tenporeki (Tenpō calendar)): The Shinsōsai (神葬祭) (Shōkonsai (招魂祭)) for the Junnan shishi (殉難志士) was held for the first time at the Shindō Sōsaijō Reimeisha (神道葬祭場霊明社) (current Kyoto Ryozen Gokoku Shrine) at Higashiyama in Kyoto. The Saijin (deities) enshrined in the Shindō Sōsaijō Reimeisha are three kami including Kukurihime no Kami (菊理媛神). April 20 — (Tenpō calendar): The tasshi (proclamation) by the Tōkaidō Senpō Sōtokufu (東海道先鋒総督府) (Tōkaidō spearhead governor) ordered the creation of a list of the war dead. 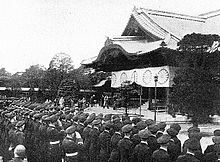 May 10 (Tenpō calendar): The Dajokan Fukoku (Proclamation or Decree by the Grand Council of State) ordered the enshrinement of the war dead at Higashiyama-ku, Kyoto (Current Kyoto Ryozen Gokoku Shrine). July 8 (Tenpō calendar): The tasshi by the Jingikan (神祇官) (Bureau of Rites) ordered the holding of the Shōkonsai. July 10–11 (Tenpō calendar): The Shōkonsai was held at the Katō Sōrenjo (河東操錬場) in Kyoto. July 29: The establishment of Tōkyō Shōkonsha: Meiji Emperor gave Tōkyō Shōkonsha an estate worth 5000 koku (nominally 10,000 koku) as eitai saishiryō (永代祭粢料). June 4: The shrine was registered to Bekkaku-kanpeisya and renamed Yasukuni shrine by Dajōan. 1894 August: The First Sino-Japanese War started and continued until April 1895. 1931 March: The Shōkonshi (招魂祠) of the Fukuba family was transferred to inside the Yasukuni precinct as Motomiya. 1932: The incident between Sophia University (Jochi Daigaku) and the Yasukuni Shrine occurred, when a student refused visit to the Yasukuni shrine with the rest of the school on the ground that it was contrary to his religious convictions. August 15: Emperor Hirohito gave a recorded radio address across the Empire on August 15. In the radio address, called the Gyokuon-hōsō ("Jewel Voice Broadcast"), he announced the surrender of Japan to the Allies. October: The General Headquarters (GHQ) planned to burn down the Yasukuni Shrine and build a dog race course in its place. However, Father Bruno Bitter of the Roman Curia and Father Patrick Byrne of Maryknoll insisted to GHQ that honoring their war dead is the right and duty of citizens everywhere, and GHQ decided not to destroy the Yasukuni shrine. September: Yasukuni Shrine was registered as a Religious Corporation of Japan. 1952 April 28: The Treaty of San Francisco came into force. August 14: A memorial service was held for 540 suicide victims after the end of the Pacific war. 1969 October 19: The Taisai (annual main festival) marking the 100th anniversary of the foundation was held, and the Ikōshu (遺稿集) (Collection of literary remains of the war dead in the Greater East Asia War (Pacific War) was issued as a commemorative publication in 1973. August 15: Takeo Miki became the first prime minister to visit the shrine on August 15, the anniversary of the Japanese surrender. He visited in a solely private capacity and underscored this by not using an official vehicle, bringing other public officials or using his title as prime minister. Similar visits continued without arousing international protests even after the enshrinement of war criminals became publicly known. November 21: Emperor Shōwa visited the Yasukuni shrine. Since then, there has not been another imperial visit to the shrine. The head-priest at the Honsenji (the Shingon sect Daigo-ha) Junna Nakata hoped that the pontiff Pope Paul VI might say a Mass for the repose of the souls of the 1,618 men condemned as Class A, B and C war criminals, and the Pope promised to say the Mass requested of him but died in 1978 without saying the Mass. 1978 October 17: Gōshisai was held to enshrine 14 dead who died from the death penalty execution of the International Military Tribunal for the Far East or died in connection with the Tribunal). Since then, the Yasukuni shrine has used the designation Shōwa Junnansya (昭和殉難者) (Martyrs of Shōwa). May 22: Pope John Paul II kept Pope Paul VI's word, and the Mass for the fallen civilians and fallen dead worshiped in the shrine including the unofficial 1,618 war criminals of Classes A, B and C took place in St. Peter's Basilica. Nakata attended the Mass, and presented the Pope with an eight-foot high replica of the Daigoji temple's five-story pagoda; inside the replica were memorial tablets Nakata had personally made for all 1,618 war criminals. The Pope blessed the replica pagoda but did not took special interest for it. August 15: Prime Minister Yasuhiro Nakasone paid his respects at the Yasukuni shrine, which initiated criticism by People's Republic of China for the first time. The criticism of Nakasone's action was so intense that neither he nor his several immediate successors visited the shrine again. 1996 Prime minister Ryutaro Hashimoto paid his respects at the Yasukuni shrine in order to fulfill a promise to a childhood mentor. July 18: The Asahi Shimbun reported that the South Korean government was reclaiming spirit tablets of Korean enshrined in the Yasukuni shrine even though Yasukuni shrine houses only Symbolic Registry of Divinities (霊璽簿, Reijibo) (Former Saishinbo (祭神簿)) and spirit tablets do not exist. August 13: Prime Minister Junichiro Koizumi, who ran against Ryutaro Hashimoto for the presidency of the Liberal Democratic Party in 2001, made a campaign pledge to visit the shrine on an annual basis regardless of the criticism it would cause, which won him support among nationalists and helped him become prime minister from 2001 to 2006. He paid his respect at the Yasukuni shrine on August 13, 2001, as a Prime Minister for the first time in 5 years since the last Hashimoto's visit. This and following Koizumi's annual visits drew extensive criticism from other East-Asian countries, particularly the People's Republic of China, where the visits stoked anti-Japanese sentiment and influenced power struggles between pro-Japanese and anti-Japanese leaders within the Chinese Communist Party. The Japanese government officially viewed the visits by Koizumi as private visits in an individual capacity to express respect and gratitude to the many people who lost their lives in the war, and not for the sake of war criminals or to challenge the findings of the Tokyo war crimes tribunal. April 21: Prime Minister Junichiro Koizumi paid respect at the Yasukuni shrine. 2003 January 14: Prime Minister Junichiro Koizumi paid respect at the Yasukuni shrine. January 1: Prime Minister Junichiro Koizumi paid respect at the Yasukuni shrine. September: The establishment of new "Sanshūden"
January 5: A Yasukuni shrine official said "the shrine has come under intense cyber attack, with its Web site barraged by e-mails believed to come from China since September 2004.". The shrine also said on its official web site "These attacks on the Yasukuni Shrine can be taken as not only attacks on the 2.5 million souls who gave their lives for the sake of the country but are also a malicious challenge to Japan, We would like to let the people [of Japan] know the Yasukuni Shrine is under attack, which is a dirty act of terrorism that negates the order of Internet technology and society." June 14: About fifty relatives of the war dead of Republic of China visited the Yasukuni shrine for the ceremony to remove spirits of Taiwanese Aboriginal soldiers, but canceled it due to Sound trucks in Japan (gaisensha, 街宣車) and requests from the police. October 12: A brief ceremony attended by priests of the Yasukuni shrine, representatives of the Japanese Ministry of Foreign Affairs and officials from the embassy of South Korea was held, and the Pukkwan Victory Monument Hokkan-Taisyō-Hi (北関大捷碑) was turned over to officials from South Korea, who returned it to its original location, which is now in North Korea. October 17: Prime Minister Junichiro Koizumi paid respect at the Yasukuni shrine. August 15: Prime Minister Junichiro Koizumi paid respect at the Yasukuni shrine on August 15 ( End of the Pacific War Day) for the first time in 21 years since Former Prime Minister Yasuhiro Nakasone's visit on August 15. 2007 June 7: Former President of the Republic of China Lee Teng-Hui paid respect at the Yasukuni shrine to honor his senior brother who died as a Japanese soldier. 2008 December 24: The Yasukuni official website was cracked by unknown hackers, the homepage content replaced, and the China national flag appeared once during this time. 2009 August 11: The Republic of China (Taiwan) Legislative Yuan Aboriginal Atayal member Kao Chin Su-mei and about 50 other Taiwanese Aboriginal members of the protested in front of the haiden of Yasukuni Shrine in an effort to remove the enshrined spirits of Taiwanese Aboriginal soldiers who died fighting for the Japanese army during Pacific War, as well as suing Japanese Prime Minister Junichiro Koizumi for visiting Yasukuni Shrine, and injured Yasukuni officers, then Japanese police officers were dispatched. 2010 August 15: Longstanding official visit to the Yasukuni shrine by the ministers of state discontinued until 2012. December 26: The shinmon (神門) was set on fire by a Chinese man, Liu Qiang. August 15: The Ministry of Land, Infrastructure, Transport and Tourism Yuichiro Hata and the National Public Safety Commission (Japan) Jin Matsubara (Minister of State for Special Missions) paid respects at the Yasukuni Shrine as state ministers for the first time since the Democratic Party of Japan assumed the reins of government. April: The Minister of Finance Tarō Asō, the National Public Safety Commission Keiji Furuya, the Minister for Internal Affairs and Communications Yoshitaka Shindo, and the Minister of State for Regulatory Reform Tomomi Inada paid their respects at the Yasukuni shrine during an annual spring festival ceremony. August 15: Three cabinet members, Keiji Furuya, Yoshitaka Shindo, and Tomomi Inada, paid their respects at the Yasukuni shrine. 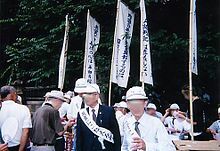 September 21: A Korean resident of Japan threatened to commit arson at Yasukuni shrine, and was arrested by Police. December 26: Prime Minister Shinzō Abe paid a visit to Yasukuni Shrine and expressed his sincere condolences, paid his respects and prayed for the souls of all those who had fought for the country and made ultimate sacrifices. He also visited Chinreisha, a remembrance memorial to pray for the souls of all the people regardless of nationalities who lost their lives in the war, but not enshrined in the honden. The visit sparked admonition from the Chinese government, which called Abe's visits to Yasukuni "an effort to glorify the Japanese militaristic history of external invasion and colonial rule ... and to challenge the outcome of World War II," as well as regret from Russia. The United States urged Japan to improve relations with neighbors after Yasukuni controversy. In an official statement, Abe explained that he wished to "report before the souls of the war dead how my administration has worked for one year and to renew the pledge that Japan must never wage a war again. It is not my intention at all to hurt the feelings of the Chinese and Korean people." A January 2014 poll by the conservative-leaning Sankei Shimbun found that only 38.1% of respondents approved of the most recent visit by Abe, while 53% disapproved, a majority of whom cited harm to Japan's foreign relations as their reason. At the same time, over 60% of respondents said they were not personally convinced by Chinese, Korean and American criticism of the visit. April: Canadian singer Justin Bieber paid a visit to the war shrine. After coming under heavy criticism from Chinese and South Korean fans, he apologized for posting a photo of his visit, claiming to have not known about the background surrounding the shrine. August 15: Three cabinet ministers visited the shrine to mark the 69th anniversary of the surrender of Japan in World War II. Prime Minister Shinzo Abe however chose not to. February 11: Kenkoku Kinensai (建國記念祭) (National Foundation Day)—Anniversary of the day on which Japan's first Emperor, Emperor Jimmu, is said to have founded the Japanese nation. July 13–16: Mitama Matsuri (みたままつり) (Mitama Festival)— A mid-summer celebration of the spirits of the ancestors. The entry walk is decorated with 40 foot high walls of more than 30,000 lanterns, and thousands of visitors come to pay respects to their lost relatives and friends. There are over 2,466,000 enshrined kami (deities) listed in the Yasukuni's Symbolic Registry of Divinities. This list includes soldiers, as well as women and students who were involved in relief operations in the battlefield or worked in factories for the war effort. There are neither ashes nor spirit tablets in the shrine. Enshrinement is not exclusive to people of Japanese descent. Yasukuni Shrine has enshrined 27,863 Taiwanese and 21,181 Koreans. Many more kami – those who fought in opposition to imperial Japan, as well as all war dead regardless of nationality – are enshrined at Chinreisha. Although new names of soldiers killed during World War II are added to the shrine list every year, no one who was killed due to conflicts after Japan signed the San Francisco Peace Treaty that formally ended World War II in 1951 has been qualified for enshrinement. Therefore, the shrine does not include members of the Japanese Self-Defense Forces which was established after the peace treaty. Enshrinement is carried out unilaterally by the shrine without consultation of surviving family members and in some cases against the stated wishes of the family members. Some families from foreign countries such as South Korea have requested that their relatives be delisted on the grounds that enshrining someone against their beliefs in life constitutes an infringement of the Constitution. The Yasukuni priesthood, however, has stated that once a kami is enshrined, it has been 'merged' with the other kami occupying the same seat and therefore cannot be separated. 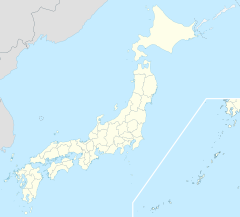 Japan has participated in 16 other conflicts since the Boshin War in 1869. The following table chronologically lists the number of people enshrined as kami at the honden (as of October 17, 2004) from each of these conflicts. The Yasukuni shrine does not include the Tokugawa shogunate's forces (particularly from the Aizu domain) or rebel forces who died during the Boshin War or Satsuma Rebellion because they are considered enemies of the emperor. They are enshrined at Chinreisha. This exclusion, which includes the ancestors of former Chief Priest Toshiaki Nanbu (2004–2009), is deeply resented in both areas. There are a multitude of facilities within the 6.25 hectare grounds of the shrine, as well as several structures along the 4 hectare causeway. Though other shrines in Japan also occupy large areas, Yasukuni is different because of its recent historical connections. The Yūshūkan museum is just the feature that differentiate Yasukuni from other Shinto shrines. The following lists describe many of these facilities and structures. On the shrine grounds, there are several important religious structures. The shrine's haiden, Yasukuni's main prayer hall where worshipers come to pray, was originally built in 1901 in styles of Irimoya-zukuri, Hirairi, and Doubanbuki (copper roofing) in order to allow patrons to pay their respects and make offerings. This building's roof was renovated in 1989. The white screens hanging off the ceiling are changed to purple ones on ceremonial occasions. The honden is the main shrine where Yasukuni's enshrined deities reside. Built in 1872 and refurbished in 1989, it is where the shrine's priests perform Shinto rituals. The building is generally closed to the public. The building located on the right side of haiden is the Sanshuden (参集殿) (Assembly Hall), which was rebuilt in 2004. Reception and waiting rooms are available for individuals and groups who wish to worship in the Main Shrine. The building located directly behind the Sanshuden is the Tochakuden (到着殿) (Reception Hall). The building located directly behind the honden is known as the Reijibo Hōanden (霊璽簿奉安殿) (Repository for the Symbolic Registers of Divinities) built in styles of Kirizuma-zukuri, Hirairi, and Doubanbuki. It houses the Symbolic Registry of Divinities (霊璽簿, Reijibo)—a handmade Japanese paper document that lists the names of all the kami enshrined and worshiped at Yasukuni Shrine. It was built of quakeproof concrete in 1972 with a private donation from Emperor Hirohito. In addition to Yasukuni's main shrine buildings, there are also two peripheral shrines located on the precinct. Motomiya (元宮) is a small shrine that was first established in Kyoto by sympathizers of the imperial loyalists that were killed during the early weeks of the civil war that erupted during the Meiji Restoration. Seventy years later, in 1931, it was moved directly south of Yasukuni Shrine's honden. Its name, Motomiya ("Original Shrine"), references the fact that it was essentially a prototype for the current Yasukuni Shrine. The second peripheral shrine is the Chinreisha. This small shrine was constructed in 1965, directly south of the Motomiya. It is dedicated to those not enshrined in the honden—those killed by wars or incidents worldwide, regardless of nationality. It has a festival on July 13. There are several different torii and mon (門) gates located on both the causeway and shrine grounds. When moving through the grounds from east to west, the first torii visitors encounter is the Daiichi Torii (Ōtorii). This large steel structure was the largest torii in Japan when it was first erected in 1921 to mark the main entrance to the shrine. It stands approximately 25 meters tall and 34 meters wide and is the first torii. The current iteration of this torii was erected in 1974 after the original was removed in 1943 due to weather damage. The Daini Torii (Seidō Ōtorii) is the second torii encountered on the westward walk to the shrine. It was erected in 1887 to replace a wooden one which had been erected earlier. This is the largest bronze torii in Japan. Immediately following the Daini Torii is the shinmon (神門). A 6-meter tall hinoki cypress gate, it was first built in 1934 and restored in 1994. Each of its two doors bears a Chrysanthemum Crest measuring 1.5 meters in diameter. West of this gate is the Chumon Torii (中門鳥居) (Third Shrine Gate), the last torii visitors must pass underneath before reaching Yasukuni's haiden. It was recently rebuilt of cypress harvested in Saitama Prefecture in 2006. In addition to the three torii and one gate that lead to the main shrine complex, there are a few others that mark other entrances to the shrine grounds. The Ishi Torii is a large stone torii located on the south end of the main causeway. It was erected in 1932 and marks the entrance to the parking lots. The Kitamon and Minamimon are two areas that mark the north and south entrances, respectively, into the Yasukuni Shrine complex. The Minamimon is marked by a small wooden gateway. Irei no Izumi (Soul-Comforting Spring): This modern looking monument is a spring dedicated to those who suffered from or died of thirst in battle. Statue of War Widow with Children: This statue honors the mothers who raised children in the absence of fathers lost at war. It was donated to the shrine in 1974 by these mothers' children. Statue of Kamikaze Pilot: A bronze statue representing a kamikaze pilot stands to the left of the Yūshūkan's entrance. A small plaque to the left of the statue was donated by the Tokkōtai Commemoration Peace Memorial Association in 2005. It lists the 5,843 men who died while executing suicide attacks against Allied naval vessels in World War II. Statue of Ōmura Masujirō: Created by Okuma Ujihiro in 1893, this statue is Japan's first Western-style bronze statue. It honors Ōmura Masujirō, a man who is known as the "Father of the Modern Japanese Army." Monument of Justice Radha Binod Pal: This newer monument was erected at Yasukuni Shrine in 2005. It honours Indian Bengali judge Radha Binod Pal, the lone justice on the International Military Tribunal for the Far East's trials of Japanese war crimes committed during World War II to find all the defendants not guilty. On April 29, 2005, Indian Prime Minister Manmohan Singh told his counterpart Koizumi Junichiro that "the dissenting judgement of Justice Radha Binod Pal is well-known to the Japanese people and will always symbolise the affection and regard our people have for your country." Statues honoring horses, carrier pigeons and dogs killed in war service: These three life-sized bronze statues were all donated at different times during the second half of the 20th century. The first of the three that was donated, the horse statue was placed at the Yasukuni Shrine in 1958 to honor the memory of the horses that were utilized by the Japanese military. Presented in 1982, the statue depicting a pigeon atop a globe honors the homing pigeons of the military. The last statue, donated in March 1992, depicts a German shepherd and commemorates the soldiers' canine comrades. Opened, full bottles of water are often left at these statues. Ōtemizusha (大手水舎) – Ōtemizusha, which means large temizuya (main purification font), was established in 1940. Dovecote (shirohato kyusha): Almost 300 white doves live and are bred in a special dovecote located on the grounds of Yasukuni Shrine. Nōgakudo (Noh Theater): Originally built in Shiba Park, Tokyo in 1881, and moved to Yasukuni Shrine in 1903. Noh dramas and traditional Japanese dance are performed on its stage in honor of the resident divinities. Yasukuni Kaikō Bunko (靖国偕行文庫) (Yasukuni Archives): Opened on October 7, 1999, archives more than 100,000 volumes including reference material that describes the circumstances under which the divinities enshrined in Yasukuni Shrine died, as well as source material for research on modern history. Yūshūkan: Originally built in 1882, this museum is located to the north of the main hall. Its name is taken from a saying – "a virtuous man always selects to associate with virtuous people." The building was repaired and expanded in 2002. The museum is a facility to stores and exhibit relics, and it also houses the weaponry of the Imperial Japanese Navy, notably including a Zero Fighter plane and Kaiten suicide torpedo. The museum has come into great controversy owing to its revisionist depiction of Japanese history, particularly of the militarist period from 1931 to 1945, in which it is perceived as denying Japanese war crimes and glorifying Japan's militarist past. Shinchi Teien (神池庭園): This Japanese style strolling garden was created in the early Meiji Era. Its centerpiece is a small waterfall located in a serene pond. It was refurbished in 1999. Sumo Ring (Sumōjō (相撲場)): In 1869, a sumo wrestling exhibition was held at Yasukuni Shrine in order to celebrate the shrine's establishment. Since then, exhibitions involving many professional sumo wrestlers, including several grand champions (yokozuna) take place at the Spring Festival almost every year. The matches are free of charge. Kōuntei (行雲亭) (Teahouse): The Kōuntei is used as a tea ceremony school room by the Urasenke from Monday to Saturday, and was used for manufacturing the Yasukuni (Kudan) sword before World War II. Yasukuni shrine is an individual religious corporation and does not belong to the Association of Shinto Shrines. Yasukuni shrine has departments listed below. The Gūji (宮司) controls the overall system, and the Gon-gūji (権宮司) assists the Gūji. In 1933, Minister of War Sadao Araki founded the Nihon-tō Tanrenkai (日本刀鍛錬会, Japanese Sword Forging Association) in the grounds of the shrine to preserve old forging methods and promote Japan's samurai traditions, as well as to meet the huge demand for guntō (military swords) for officers. About 8,100 "Yasukuni swords" were manufactured in the grounds of the Yasukuni Shrine between 1933 and 1945. ^ "History". Yasukuni.or.jp. Retrieved 2016-03-03. ^ a b "Deities". Yasukuni.or.jp. Retrieved 2008-04-13. ^ Ponsonby-Fane, Richard. (1963). The Vicissitudes of Shinto, pp. 118–134. ^ a b c Hiyama, Yukio (21 August 2013). "How Japan Honors Its War Dead: The Coexistence of Complementary Systems". Nippon.com. Retrieved 26 December 2013. ^ "Yomiuri Shimbun: 基礎からわかる靖国神社問題】Ｑ　戦前、戦後　どんな役割？" (in Japanese). Archived from the original on 2006-08-31. Retrieved 2007-01-30. ^ a b c Momoki Kamo (1912) 靖国神社誌(Yasukuni jinjashi). ^ a b c d Yasukuni Jinja hen (1983–87) 靖国神社百年史 全4卷、資料篇・事歴年表 (Yasukuni Jinja hyakunenshi : Shiryō hen, Volume 1–4). ^ a b c "Author: Yasukuni Jinja, Yasukuni Jinja Shamusho (1973) 靖国神社略年表Yasukuni jinja ryakunenpyo". ^ a b A. Hamish Ion (February 1999). The Cross in the Dark Valley The Canadian Protestant Missionary Movement in the Japanese Empire, 1931–1945. ISBN 978-0-88920-294-8. Archived from the original on 2004-08-19. Retrieved 2014-01-06. ^ a b c d "PDF, ACTES DE S.S.PIE XI, texte latin et traduction francaise, TOME XIV (Annee 1936), Instruction Pluries Instanterque, MAISON DE LA BONNE PRESSE, Paris. (Latin-French)" (PDF). ^ a b c d e f g h i "John Breen, "Popes, Bishops and War Criminals: reflections on Catholics and Yasukuni in post-war Japan　法皇、司教、戦犯−−戦後日本のカトリックと靖国"". japanfocus.org. ^ Takahashi, Tetsuya (6 April 2007). "Yasukuni Shrine at the Heart of Japan's National Debate: History, Memory, Denial". The Asia-Pacific Journal: Japan Focus. Retrieved 27 December 2013. During Japan's colonial period the emperor was the sovereign and religious power, and commanded its armies. The populations of Japan and its colonies were all regarded as his servants, with a moral duty "to dedicate themselves to the emperor and the state in times of national crisis, with no regard for their own lives." Soldiers who died during these wars, which were considered holy, were an example to the nation and it was the responsibility of the Yasukuni shrine to raise military morale and foster the spiritual mobilisation of the nation for war. ^ a b c d e f g Higurashi, Yoshinobu (25 November 2013). "Yasukuni and the Enshrinement of War Criminals". Nippon.com. Retrieved 26 December 2013. ^ Jeong, Nam-ku (7 September 2013). "Why do Japanese politicians continue to visit the Yasukuni Shrine?". The Hankyoreh. Retrieved 27 December 2013. The Japanese soldiers who fought in World War II willingly went to their death shouting "Long live the Emperor!" and they reminded each other that they would meet again at Yasukuni after they died. Hanging here and there from the cherry trees in the garden in front of Yushukan are wooden placards bearing the names of Japanese military units. ^ Tetsuya, Takahashi. "Yasukuni Shrine at the Heart of Japan's National Debate". Japan Focus. Archived from the original on 2008-04-04. Retrieved 2008-03-23. ^ Okuyama, Michiaki (2009). "THE YASUKUNI SHRINE PROBLEM IN THE EAST ASIAN CONTEXT: RELIGION AND POLITICS IN MODERN JAPAN: Foundation" (PDF). Retrieved 1 January 2014. As part of the reforms initiated by GHQ, in February 1946 some 86,000 of the total of approximately 106,000 Shinto Shrines were merged into Jinja Honcho (the Association of Shinto Shrines) to form a private religious corporation. ... Yasukuni Shrine, however, chose to become an individual religious corporation keeping itself apart from the Association of Shinto Shrines, on the ground that its function under the imperial regime had been completely different from other Shinto shrines. ... In November 1946, GHQ decided to allow that the precinct of national property where religious facilities were located to be transferred to each facility as a private organization, but this decision did not apply to Yasukuni Shrine and other militaristic shrines. It was only after the peace treaty was effectuated in 1952 that the status of Yasukuni Shrine as a private religious corporation was finally established. ^ a b "Deities at Yasukuni Shrine". THE KOREA TIMES. 2013-06-02. Retrieved 2013-01-06. ^ a b Sato, Jun (21 January 2012). "Documents show state led move to enshrine war criminals at Yasukuni". Asahi Shimbun. Archived from the original on 27 December 2013. Retrieved 27 December 2013. ^ "Hirohito quit Yasukuni Shrine visits over concerns about war criminals". New York Times. 26 April 2007. Retrieved 26 December 2013. ^ Hotta, Eri (2007). Pan-Asianism and Japan's war 1931–1945. Houndmills, Basingstoke, Hampshire, RG21 6XS, England: Palgrave Macmillan. ISBN 9780230601031. Retrieved 2014-10-15. ^ a b Zakowski, Karol (2012). "Reaction to Popular Pressure or a Political Tool? Different Interpretations of China's Policy Regarding Koizumi's Visits to the Yasukuni Shrine" (PDF). Journal of Contemporary Eastern Asia. 11 (2): 47–60. Archived from the original (PDF) on 2013-12-27. ^ "Basic Position of the Government of Japan Regarding Prime Minister Koizumi's Visits to Yasukuni Shrine". Ministry of Foreign Affairs of Japan. October 2005. Retrieved 27 December 2013. The Prime Minister has stated clearly that the purpose of his visits to the shrine is that he does not visit for the sake of the Class-A war criminals, and that Japan accepted the results of the International Military Tribunal for the Far East. He has acknowledged that Japan, "through its colonial rule and aggression, caused tremendous damage and suffering to the people of many countries, particularly to those of Asian nations." ^ "Chinese suspected of attack on Tokyo shrine's Web site". Taipei Times. 2005-01-07. Archived from the original on 2004-08-19. Retrieved 2014-01-06. ^ "페이지를 찾을 수 없습니다". English.kbs.co.kr. Archived from the original on 2007-09-29. Retrieved 2015-11-19. ^ "Taiwanese Politician Faces Charges Over Yasukuni Protest". Japan Probe. August 12, 2011. Archived from the original on March 25, 2014. ^ Chang, Mao-sen (August 12, 2011). "Tokyo police charge lawmaker May Chin with assault". Japan Probe. Staff Reporter in TOKYO. p. 1. ^ "Warrant issued for Yasukuni arsonist". The Japan Times. Retrieved 2015-11-19. ^ "Yasukuni fire suspect spouts gripe". The Japan Times. Retrieved 2015-11-19. ^ "Yasukuni arson suspect leaves Seoul for China; Abe issues regret". The Japan Times. Retrieved 2015-11-19. ^ "Free Uyghur (世界ウイグル会議 第4回代表大会開会式&懇親会)". Japanese Culture Channel Sakura. 2012-05-17. ^ "Korean man arrested for trespassing in Yasukuni Shrine grounds ‹ Japa…". 7 July 2014. Archived from the original on 7 July 2014. ^ "Tokyo's Yasukuni shrine 'in arson attack'". Telegraph. Retrieved 2015-11-19. ^ "Basic Position of the Government of Japan Regarding Prime Minister Koizumi's Visits to Yasukuni Shrine". Ministry of Foreign Affairs of Japan. 2013-12-26. Retrieved 2014-01-06. Statement by Prime Minister Abe "Pledge for everlasting peace"
^ "Japanese prime minister visits Yasukuni war shrine". Mainichi Shimbun. 26 December 2013. Archived from the original on 27 December 2013. Retrieved 26 December 2013. ^ "Japanese Premier Visits Contentious War Shrine". The New York Times. 26 December 2013. Retrieved 26 December 2013. ^ "Russia expresses regret over Abe's Yasukuni shrine visit". Mainichi Shimbun. 26 December 2013. Archived from the original on 2 February 2014. Retrieved 26 December 2013. ^ "Japanese prime minister visits Yasukuni war shrine". Mainichi Shimbun. 2014-01-06. Retrieved 2014-01-06. ^ "Statement by Prime Minister Abe". Ministry of Foreign Affairs of Japan. 26 December 2013. Retrieved 27 December 2013. ^ "Justin Bieber apologizes for posting Tokyo war shrine photo". IANS. news.biharprabha.com. Retrieved 24 April 2014. ^ "Justin Bieber apologises for visiting Yasukuni Shrine in Japan: Site at centre of international row honours convicted WWII war criminals". Independent.co.uk. 23 April 2014. ^ "Abe avoids war shrine to placate neighbours on WWII surrender anniversary". The Japan News.Net. 15 August 2014. Retrieved 15 August 2014. ^ "Explosion damages toilet at Japan's controversial shrine for war dead". Reuters. 23 November 2015. Retrieved 24 November 2015. ^ "About Yasukuni Shrine│Yasukuni Shrine". yasukuni.or.jp. ^ Nobumasa, Tanaka (2004-05-27). "Yasukuni Shrine and the Double Genocide of Taiwan's Indigenous Atayal: new court verdict". Znet. Archived from the original on 2004-08-19. Retrieved 2008-04-13. ^ a b "鎮霊社". Yasukuni Shrine. Retrieved 2009-10-16. ^ "Suit filed over Korean soldiers enshrined at Yasukuni Shrine". 2001-06-29. Retrieved 2013-10-24. ^ a b c d e f g h i j k l m n o p 靖国神社 (in Japanese). 2004-10-17. Retrieved 2008-04-13. ^ Designing History in East Asian Textbooks: Identity Politics and transnational aspirations. 2011. Retrieved 2013-12-31. ^ "国立公文書館 アジア歴史資料センター". jacar.go.jp. Archived from the original on 2011-09-27. ^ a b c Breen, John (2005-06-03). "Yasukuni Shrine: Ritual and Memory". Japan Focus. Archived from the original on 2008-04-17. Retrieved 2008-04-13. ^ a b Igawa, Sei (2005-10-10). "Japan-Vietnam relations, were based on the performance of Japanese volunteers in Vietnam Independence War" (PDF). Tokyo Foundation (in Japanese). Retrieved 2009-09-06. ^ "Haiden (Main Hall)". Yasukuni Shrine. Retrieved 2008-03-23. ^ "Honden (Main Shrine)". Yasukuni Shrine. Retrieved 2008-03-23. ^ "Sanshuden (Assembly Hall)". Yasukuni Shrine. Retrieved 2008-03-23. ^ "Tochakuden (Reception Hall)". Yasukuni Shrine. Retrieved 2008-03-23. ^ "Reijibo Hoanden (Repository for the Symbolic Registers of Divinities)". Yasukuni Shrine. Retrieved 2008-03-23. ^ "Motomiya(Original Shrine)". Yasukuni Shrine. Retrieved 2008-03-23. ^ "Chinreisha (Spirit-Pacifying Shrine)". Yasukuni Shrine. Retrieved 2008-03-23. ^ a b Ponsonby-Fane, p. 130. ^ "Daiichi Torii (First Shrine Gate or Great Gate)". Yasukuni Shrine. Retrieved 2008-03-23. ^ "Daini Torii (Second Shrine Gate)". Yasukuni Shrine. Retrieved 2008-03-23. ^ "Shinmon (Main Gate)". Yasukuni Shrine. Retrieved 2008-03-23. ^ "Chumon Torii (Third Shrine Gate)". Yasukuni Shrine. Retrieved 2008-03-23. ^ "Ishi Torii (Stone Shrine Gate)". Yasukuni Shrine. Retrieved 2008-03-24. ^ "Day 7 – Independent Activities". Japan Fulbright Memorial Fund. Retrieved 2008-03-24. ^ "Statue of War Widow with Children". Yasukuni Shrine. Retrieved 2013-01-04. 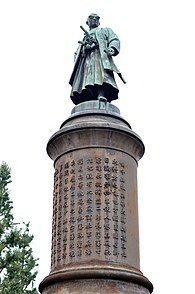 ^ "Statue of Omura Masujiro". Yasukuni Shrine. Retrieved 2008-03-24. ^ "Monument of Dr. Pal". Yasukuni Shrine. Retrieved 2008-03-28. ^ "Dr. Manmohan Singh's banquet speech in honour of Japanese Prime Minister". Indian Prime Minister's Office. April 29, 2005. Archived from the original on December 12, 2005. Retrieved 2009-09-21. ^ "Statues honoring horses, carrier pigeons and dogs killed in war service". Yasukuni Shrine. Retrieved 2008-03-24. ^ a b c d "追悼・平和祈念のための記念碑等施設の 在り方を考える懇談会 （第２回）議事　（資料１－１、靖国神社について）". a round-table conference by Chief Cabinet Secretary. Retrieved 2014-01-14. ^ "Otemizusha (Main Purification Front)". Yasukuni Shrine. Retrieved 2009-10-23. ^ "Dove cote". Yasukuni Shrine. Retrieved 2008-03-28. ^ "Nōgakudo". Yasukuni Shrine. Retrieved 2014-01-03. ^ "Shamusho". Yasukuni Shrine. Retrieved 2014-01-03. ^ "Yasukuni Kaikan". Yasukuni Shrine. Retrieved 2014-01-03. ^ "Yasukuni Kaikō Bunko". Yasukuni Shrine. Retrieved 2014-01-03. ^ "Shinchi Teien". Yasukuni Shrine. Retrieved 2014-01-04. ^ Yoshida, Takashi (2 December 2007). "Revising the Past, Complicating the Future: The Yushukan War Museum in Modern Japanese History". The Asia-Pacific Journal: Japan Focus. Retrieved 26 December 2013. The newly renovated Yushukan that opened in 2002 has two major goals: the first is to honor the war dead who sacrificed themselves for the state, and the second is to communicate an allegedly "true" history to counter the fact that Japanese education in the postwar era emphasized Japan's wartime wrongdoings. The museum articulates the position that the "Greater East Asian War" contributed to liberating Asia and that the war was not an act of imperialist aggression. ^ "Shinchi Teien". Yasukuni Shrine. Retrieved 2008-03-28. ^ "Sumo Ring". Yasukuni Shrine. Retrieved 2008-03-28. ^ "Shōkonsaitei". Yasukuni Shrine. Retrieved 2014-01-03. ^ "Seisentei". Yasukuni Shrine. Retrieved 2014-01-03. ^ "Kōuntei". Yasukuni Shrine. Retrieved 2014-01-03. ^ "Yasukuni shrine's top priest Toshiaki Nambu dies". Retrieved 2014-01-02. ^ "New Yasukuni chief priest picked". Retrieved 2014-01-02. ^ "New Head Priest of Controversial Yasukuni Shrine Appointed". Retrieved 2014-01-02. ^ "靖国神社１１代宮司に徳川康久氏" [Yasuhisa Tokugawa named 11th Head Priest of Yasukuni Shrine]. 18 January 2013. Archived from the original on 20 January 2013. Retrieved 19 November 2015. ^ "The Yasukuni Shrine Problem in the East Asian Context: Religion and Politics in Modern Japan: Foundation" (PDF). Retrieved 1 January 2014. Nelson, John. "Social Memory as Ritual Practice: Commemorating Spirits of the Military Dead at Yasukuni Shinto Shrine". Journal of Asian Studies 62, 2 (May 2003): 445–467. Pye, Michael: "Religion and Conflict in Japan with Special Reference to Shinto and Yasukuni Shrine". Diogenes 50:3 (2003), S. 45–59. Saaler, Sven: Politics, Memory and Public Opinion: The History Textbook Controversy and Japanese Society. München: Iudicium, 2005. ISBN 3-89129-849-8. Shirk, Susan L. China: Fragile Superpower: How China's Internal Politics Could Derail Its Peaceful Rise. Oxford University Press, US. 2007. ISBN 0-19-530609-0. Breen, John. "The Dead and the Living in the Land of Peace: A Sociology of the Yasukuni Shrine". Mortality 9, 1 (February 2004): 76–93. Breen, John. Yasukuni, the War Dead and the Struggle for Japan's Past. Columbia University Press, 2008. ISBN 0-231-70042-3. Sheftall, M. G. (2005). Blossoms in the Wind: Human Legacies of the Kamikaze. NAL Caliber. ISBN 0-451-21487-0. Sturgeon, William Daniel (August 2006). Japan's Yasukuni Shrine: Place of Peace or Place of Conflict? Regional Politics of History and Memory in East Asia. Dissertation.com. ISBN 1-58112-334-5. Ijiri, Hidenori. "Sino-Japanese Controversies since the 1972 Diplomatic Normalization". China Quarterly 124 (Dec 1990): 639–661. Shibuichi, Daiki. 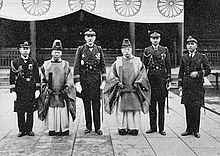 "The Yasukuni Dispute and the Politics of Identity of Japan: Why All the Fuss?" Asian Survey 45, 2 (March–April 2005): 197–215. Tamamoto, Masaru. "A Land Without Patriots: The Yasukuni Controversy and Japanese Nationalism". World Policy Journal 18, 3 (Fall 2001): 33–40. Yang, Daqing. "Mirror for the Future of the History Card? Understanding the 'History Problem'" in Chinese-Japanese Relations in the Twenty-first Century: Complementarity and Conflict, edited by Marie Söderberg, 10–31. New York: Routledge, 2002. Wikimedia Commons has media related to Yasukuni Shrine. "Prime Minister's Visits to Yasukuni Shrine". Ministry of Foreign Affairs of Japan (MOFA). Reiji Yoshida (December 20, 2004). "Chief Yasukuni priest brings business savvy to shrine". Japan Times. Tadayoshi Nakamura. "Yasukuni Jinja on the 60th anniversary of Japan's surrender". Archived from the original on 2015-06-01. "Discussion of the impact of Prime Ministerial visits to Yasukuni Shrine". Trans-Pacific Radio. September 9, 2006. Archived from the original on January 29, 2007. Takahashi, Tetsuya (March 6, 2007). "Postwar Japan on the Brink: Militarism, Colonialism, Yasukuni Shrine". CHIASMOS. Uchicago.